Kanha is famous for its lush green grasslands and towering Sal forest. Kanha is popular for Tigers, bird watching & is the last home of the only surviving population of Hard Ground Barasingha (Swamp Deer). 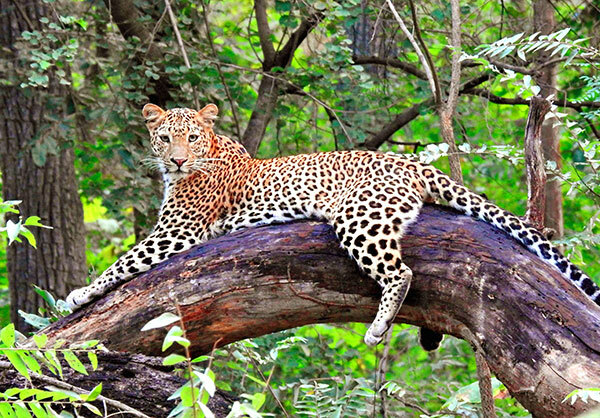 Satpura is more popular for Leopards, Sloth Bear, Crocodiles & migratory birds. While in Kanha the focus is on jeep safaris, Satpura offers a unique way of exploring the park by foot, boat, jeep or elephant. Day 01: Satpura National Park Reach Denwa Backwater Escape by lunch, followed by an evening boat ride on Denwa River. Day 02: Satpura National Park Morning and evening jeep safaris in Satpura Tiger Reserve. Day 03: Satpura National Park Morning elephant or walking safari in Satpura Tiger Reserve,. Late evening jeep safari in buffer to spot nocturnal wildlife. Day 04: Satpura – Kanha National Park Post early breakfast drive to Kanha Tiger Reserve (7-8 hours). Packed lunch will be provided by the lodge for the journey. Dinner and overnight Kanha Earth Lodge. Day 07: Kanha National Park Post breakfast, transfer for further connections. Tour cost: USD 1375 per person on twin sharing. Book 130 days in advance and get 10% off on total tour cost. Road Transfers by air conditioned Toyota Innova or similar between Satpura and Kanha. Park is closed on Wednesady afternoon and on festivals. The forest department may close the park due to rain also on a short notice.